I was invited to a fancy dress party on Saturday night where you had to dress as something beginning with C (yes, I snickered at first too). Ever one to use any excuse to dress up EGL, I went as a Cancan dancer, albeit a Victorian one. I wore several tutus and bloomers/underskirt underneath the big bustle skirt, so it was truly huge and pouffy. Black & white striped stockings paired with the victorian looking boots gave a cancan or saloon girl look to the outfit. Have a look. 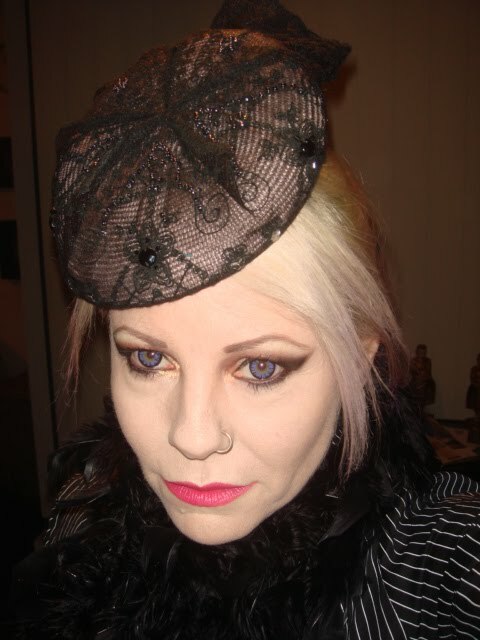 My beaded lace over straw percher sloped down to reveal a smoky eye, circle lenses in violet (from Pinky Paradise in G&G; BT02) and bright pink lips. Oh, I mustn’t forget my other half – he went as a clown. He wasn’t meant to be a scary one, but judge for yourself…and check out the Crow while you’re there. What do you think of our get-ups? There was a great Centurion there, the Crow, Jimmy Cagney, 2 Captain Hammers (from Dr Horrible’s Singalong Blog), numerous cats and one Cheetah, a cross-dressing cyclist, a cheerleader-come-drinking coach and a Catholic Priest. Next week is a club I love a lot – Black Cherry – so there WILL be more dressing up! Your smoky eye is amazing. And you make the circle lenses tempting. I will have to go through your prior posts and see which lenses are less irritating. You look amazing! Love, love, love your outfit and your make-up is SUPERB. Thank you so much Corinne!! 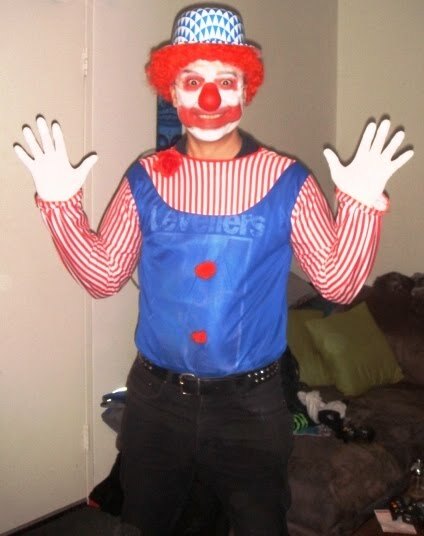 I love your costume! Looks like a fun party! Oh thanks! I love your fashion sense, so I take that as a huge compliment! Actually, I've seen pics of you before on facefail at Die Machine or something like that and I remember admiring your outfits. I was really surprised when I just randomly came across your blog. The boots are nice, aren't they? Thanks 🙂 Why don't you dress like this for a party or something one of these days?